【Battery Powered & 3 light modes(Always ON/Flash/OFF)】 Each set includes a small battery box for easy installation anywhere without having to worry about your display being near an outlet or power source. Clothespins open and close and LEDs remain cool to keep attached items safe. It can be put or hung on walls, windows, doors, floors, ceilings, grasses, Christmas trees etc. No matter indoor or outdoor. 【Wide Application】Indoor Fairy String Lights are ideal for hanging photos, holiday cards, children's artwork, or whatever lightweight crafty/decorative items you desire. This makes for a great decoration for any type of situation you have in hand such as a birthday party, wedding Christmas parties or anything you want to make classy. The lights give its touch that makes everything else as the background but in such a good way. 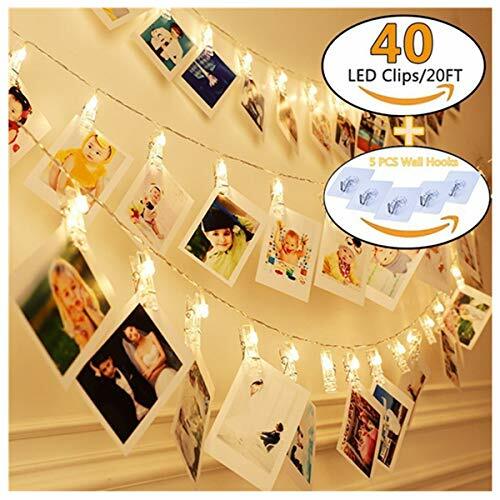 【A Perfect Decoration Light】Photo Clips String Lights for Decorativing your garden, porch, living room,bedroom, even the party with the string light to add a beautiful glow to your life. Beyond in house decoration, it can be used in special occasion like Valentine's Day, banquet, propose, wedding displaying your photo, etc. If you have any questions about this product by KAZOKU, contact us by completing and submitting the form below. If you are looking for a specif part number, please include it with your message.